An old Gīkūyū man sharing stories with his grandchildren as they play with his beard. 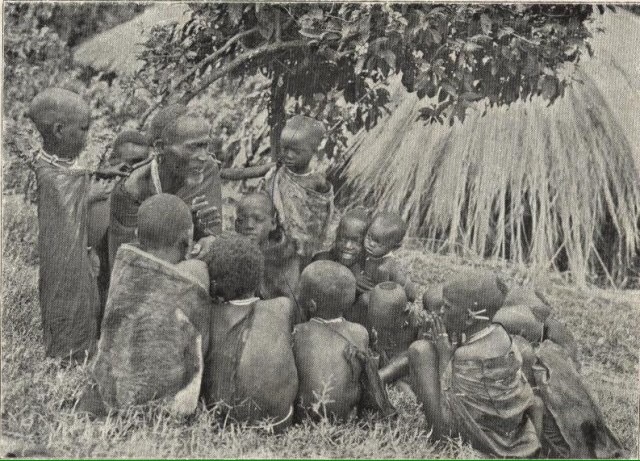 A picture we used in the post, “Stages of a Gīkūyū Man’s Life”, showed an old man, whom we refered to as a library, sorrounded by a group of eager youngsters as he told them fairy tales. 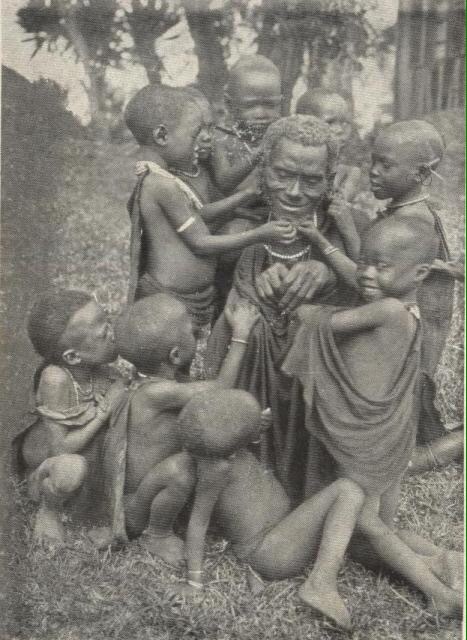 The old man, Guuka to the children, and the children, look extremely happy and even unaware that they are engaged in that great business of passing knowledge from one generation to another. More pictures from our archives confirm the well known fact that traditionally youngsters learnt from their elders mainly through engaging in the practical activities or through stories told to individuals in groups around the fire or in music and dance. They learnt without the self concious knowing that they were learning anything great and became learned while still in that happy state of unknowing – knowing not that they knew. This state of unknowing is the highest in the four stages of knowledge – not knowing that you don’t know; knowing that you don’t know; knowing that you know and not knowing that you know. That last requires a deliberate exercise of will to embrace the humble state of shedding all trappings of knowing, thus the reason it is called unknowing. Catholic mystiques refer to that state as being enveloped in “the cloud of unknowing”. 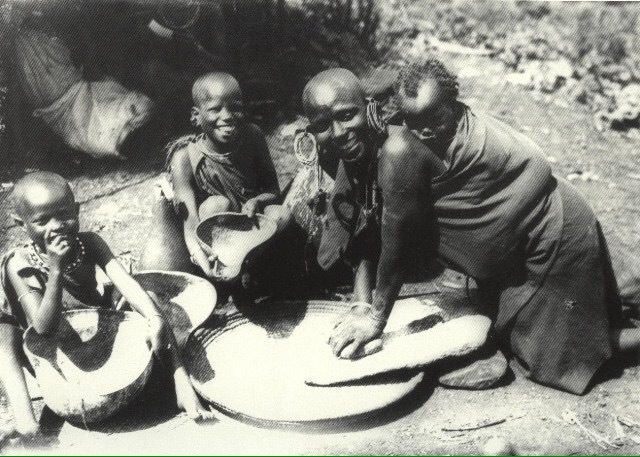 A Gikuyu woman using grinding stones in the elaborate process of preparing fermented gruel, ūcūrū. The assistants follow the process keenly. In the above picture of a woman grinding grain as part of the elaborate process of making gruel, ūcūrū, the little baby on her back blissfully feels the wonderful rhythms produced by the mother. It is known that children internalise these cosmic rhythms even before they are born. The baby is also exposed to the sounds, the aromas, the stillnesses of the entire process of making ūcūrū without it knowing even what to know. The two little sisters following keenly the process know that they don’t know the process and are eager to learn. In the deep shadow of the hut is an older girl who sets herself separate afar from the central drama as she believes that she knows everything there is to know. She knows that she knows, poor girl. Her mother, the central sun of this dramatic picture is the Truth that speaks not of itself but for itself; what the Chinese call the Tao, the one that does not know itself to be the Tao; what the Gikuyu called, the Ma Itū, Our Truth. She is untouched and unconcerned with the knowledge of the making of ūcūrū. These traditional knowledge systems and processes do not rely on certifications or diplomas as they are self affirming and self justifying needing no external validation. Recently I nearly attended a graduation ceremony of my little nephew. He was clad, as I later came to see from the framed picture, in all the blackness of the darkest night as he was granted the power to read and do all that appertains to Kindergarten knowledge. Well, I do remember the same fellow on his second day of school being woken up very early by the maid and being reminded it was time for school. Still half asleep, his answer was beyond anything our so-called comedians can master, “Si anti I finished that yesterday?” Sadly, he had no idea he had been fingered, numbered and been had just as a little fish entering the net has no idea it’s been had until it’s drawn out of the water. Today, many children like my little nephew have their childhood stolen away in the name of education. How can we justify children as young as four carrying huge heavy bags on their backs, waking up at 4.00 am. in order to arrive at school before 6.00 am? They are not let out of the pen, sorry, classroom, to play outside in the sun. There is no story telling time, no art, no craft, no singing, no physical education, PE, daily. It’s numbers, formulas, dates, locations, names, etc. etc. memorising, rote learning, drilling drilling, drilling. On top of that they are given homework that makes sure the kid can never sleep before 9 or 10 pm. Schooling has become a pain to most children and only the most udjusted to this insanity can stand it. A collective insanity grips the entire Nation on the day Kenya Certificate of Primary Education results are released, Isn’t the modern schooling system a high form of child abuse perpetrated mainly by adults who have no idea what they do? They know not that they know not and to such, no explanation is possible. The modern education system (and please let us not confuse schooling with learning) was designed by social engineers in order to mold young minds into accepting authority and to teach them the very basic skills that they will need to be a part of the unquestioning work force and consumer culture. Schools do not teach people how to think but only what to think, or more accurately how to remember and regurgitate information which has been fed to them. It teaches them to repeat like sheep whatever they are fed by an authority figure. Things like Cholesterol is bad, Baaa! Refined sugar is energy for your body, Baaa! Muslims are terrorists, Baaa! Schooling is learning, Baaa! Television is a modern necessity just like air, my doctor said, my pastor said, my dematologist said, my mundu mugo said, Baaa! Baaa! Baaa! Baaa! I will agree with the great physicist, Albert Einsten, “If you want your children to be intelligent, read them fairy tales. If you want them to be more intelligent, read them more fairy tales.” Though my friend Albert is such a great authority figure, I would ask him to look at the superiority of telling fairy tales to reading fairy tales. You read what is fixed, static. Telling stories in the oral tradition as the Gīkūyū did and Albert’s people did long time ago, is creative, ever new, and wondrous. 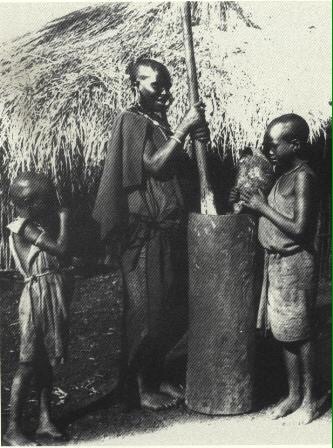 A Gīkūyū woman pounding grain with a mortar and pestle, mūūthī na ndīrī. Note the young assistants and how they learn in word and deed from the older woman. 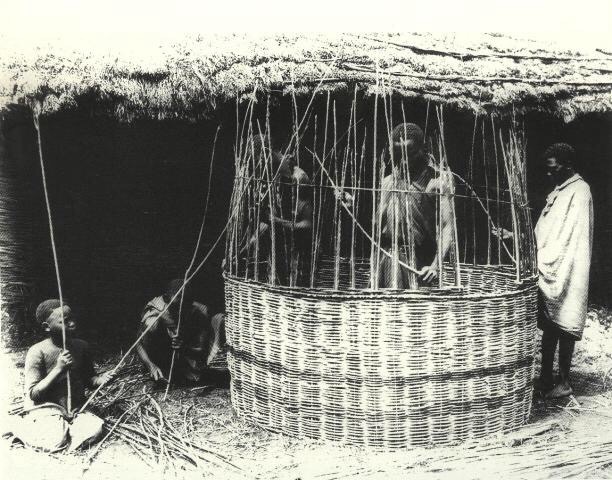 A Gīkūyū class in session. Note that there is no uniform an important point in the naturing of individuality and creative thinking. The first step in the control system is to try to put students in uniform. Story telling is a lost art. I have tried to see how many children follow it even on TV, but surprisingly, only those who have participated and want to see themselves on TV. The same TV has become the master in the house. We all rotate around it and discuss what it says. Very unfortunate. Thanks Mukuyu for reminding us this lost art. Nì thengio mūno. Very true.we lost direction the day we thought that mzungu education is the best.Not at all,our traditional way of education was far much superior,authentic & more educative.if only our fore fathers were in a position to fully resist the advancement of the white man.Unfortunately,they had no choice but to embrace it.The Japanese realized their traditional education is much more better than the white man’s,thats why they teach their children,their basic education in mother tongue right from the beginning.will we ever see the return to traditional education?…thats for us to guess…..
Vasco da gama,evolution of mankind,christopher columbus,etc is what they “learn “at school at the expense of vital life skills. I love the pictures very much. They are like ….. I dont know…. decoded. Thanx. and ols for many pix on tis site. thanks again.